“Take this mug for a ride…Boom! Burn! Bip! Yeah! Pow! Hey, ha ha. Down with the dc Talk…” used to bump from the JBL Powerbass 10” subs located in the trunk of my 1989 Chevy Cavalier. Boy, back in the da’ day it was fly to be bumpin’ the bass, and no, I don’t mean those pesky black things flying in the air. The year was 1994 and it was a time of low-riders and big speakers and lots of bass. It was also the year I became a believer in Christ and I was trying to change some of the things in my life. One of those things was my choice of music. I listen to all kinds of music. I like classic/hard rock, country, rap and hip hop. It was then that I started listening to different genres of Christian music. One of the groups I was introduced to was DC Talk, you know Toby Mac’s old band. Back then, DC Talk was more hip hop/rap than anything else and one of my favorite songs was “Luv is a Verb”. Great song, but the problem was, I had no real idea what that song was even about and how it applied to my life back in the day. Now, almost 21 years later, I have a better understanding of what Toby and the boys were singing about in “Luv is a Verb”. 1. Real Love is Sacrificial. Out of God’s Love for us, Jesus Christ left heaven, became a man, took our place on the cross and died for us! He took our punishment in order for us to have eternal life with the Father. Jesus said: “There is no greater love than to lay down one’s life for one’s friends.” John 15:13 (NLT). That is a sacrificial love! So is Jesus specifically telling us that we need to die for someone? No, I don’t think so. However, there are going to be times that we will need to make a sacrifice in order to show Real Love to others. We will have to sacrifice of our time, resources, and energy in order to show Real Love to those around us. You might already have something planned for the day when a friend calls and really needs your help. What would Real Love do? Real Love makes a sacrifice. Are you willing to make some sacrifices in your life to show “Real Love:” to those around? 2. Real Love is Compassionately Generous. Most of the people I know have enough money to live on and live well, even if they don’t think so. If there is something that they want, they will have the money to buy whatever it is that they are wanting; even if they think they’re broke. What it boils down to is what’s important to them. It’s not about the money. So if money is not the problem when it comes to being generous, what is? The problem is when our thoughts and concerns consist of only 3 people: Me, Myself and I! You know them? Ya, me too! It’s called selfishness and it’s a shame really. Most people have enough money to live on and to show real love through being generous. However, it doesn’t just stop with our wallets. We are selfish with other things; such as our time, talents and resources. Am I right? I think so. Think about it. When we do give, how much do we give (money, time and resources) to someone or a cause? Maybe we give just the bare minimum? We succumb to their plight and say things such as: “Well, I only have $5.00; 30 minutes to help” and so on knowing that we really have more to give. Now, don’t get me wrong, there are times when we do only have $5.00, 30 minutes or whatever it is to give. But I’m talking about those times. So why do we this? Well, we do this so that we can get them out of your hair so that we can get back to whatever we (me, myself, and I) were doing. Many times we have the ability to show others love through being generous but we don’t due to the fact we are so focused ourselves. 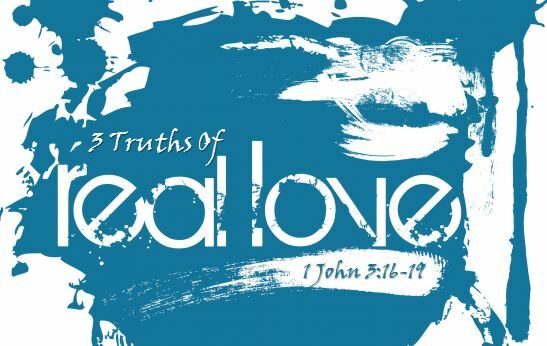 So what drives Real Love through generosity? According to 1 John 3:17 the answer is Compassion! Compassion is having a sympathetic concern and authentic desire to help someone in their time of need! We see this displayed in Matthew 9:36 when Jesus saw all the people who were in need of a savior. It says that He felt compassion for them. It was His compassion for me and you in our helplessness that Jesus generously went to the cross. You might not think that Jesus was giving generously by dying on the cross, but think about it! Jesus gave ALL of His life for us, not just some of His Life. He showed us Real Love. So, when we are generously giving of ourselves, with compassion; we show those around us a Real Love. Are you being selfish with your giving or do you need to show compassion and give generously next time someone is in need? In today’s society we hear the word “love” everywhere. How often do we hear “I love you” or “I absolutely love this”? We use the word “love” for everything! But the question is: how often do we show love? Remember, our actions speak louder than our words! We can tell people all day long that we love them, but if we don’t show them it doesn’t really mean a thing to them. It’s just a bunch of words and talk is cheap. It takes an effort to put into action a Real love that is sacrificial, compassionate and generous! Would we believe that our Heavenly Father really loves us with an everlasting love had He failed to take action in showing His Love us? Probably not. In fact, we would be hard pressed to believe that He loved us at all. However, the Father showed us His love by sending Jesus to die on the Cross so that you and I could have eternal life! This is the greatest demonstration of Real Love through ACTION that we could ask for in life! And the truth is we have the opportunity to put into action a REAL LOVE to those around us by making sacrifices and being compassionately generous with our time, money and resource. When we do that, we are actually pointing to God’s Love. His sacrificial and compassionately generous love is the greatest Real Love a person can experience! Honestly, I need help in all three areas of showing Real Love, how about you? Which areas in your life do you need to show more Real Love towards others? I would love to hear from you! This is clarity. I’m thankful for our everlasting sacrifice! Great read! You’re right YB! His demostration of Real Love is everlasting for sure! Good words Bro! Love is for sure and action, not a feeling! Sometimes the hardest thing to do is love the ones you don’t like, but its what we are called to do. Thanks Bill! Love is sometimes the hardest thing to do in our lives! But when we show real love something happens in us! Real Love not only can change those whom we are showing the love to, it actually changes us!